At the Autodromo di Modena in the Northern Italian region of Emilia-Romagna you can take a Ferrari F430 Challenge racecar for a spin around a track. 'Hard on the brakes, easy on the gas," cautions my instructor from the passenger seat as I'm strapped in behind the wheel of a Ferrari F430 Challenge. Easier said than done with a rookie behind the wheel of this 490-horsepower, V8-powered race car. I'm trying my best to channel Michael Schumacher at the Autodromo di Modena in the northern Italian region of Emilia-Romagna – equally famous as the birthplace of Italy's luxury-car industry and as a favourite destination for gourmands from Italy and beyond who appreciate traditional, authentic food. Two laps around this popular test track will set you back a cool €450 ($670) – souvenir ball cap and shot of prosecco included. For some people, that's probably nothing compared with the bragging rights – after all, the nearby town of Modena is the birthplace of Enzo Ferrari, the name most synonymous with speed, luxury and glamour. The Ferrari factory is still located here in Motor Valley, situated along the ancient Roman road called the Via Emilia. So, too, are the headquarters of other Italian automotive brands such as Lamborghini, Ducati, Maserati and Pagani, along with several private vintage-car collections and automotive museums. The most famous of Motor Valley's supercar shrines is the Enzo Ferrari Museum, which opened in 2012. It stands on the very spot where Modena's most famous son (along with fellow homeboy Luciano Pavarotti) first heard the music of machinery in his father's rail-carriage workshop before going on to revolutionize the auto industry. Incorporating the motorcar maestro's restored childhood home into a futuristic design by the late architect Jan Kaplicky, its sloping yellow roof is shaped like a Ferrari bonnet. Classic Ferrari cars, boats and engines are displayed inside the main galleries, while black-and-white movies recounting Ferrari's remarkable life and achievements are projected onto gleaming white walls. This year marks the 70th anniversary of the Prancing Horse, the famous logo that Ferrari borrowed from one of his heroes, First World War Italian fighter ace Count Francesco Baracca, who had painted it on the sides of his planes. To mark the occasion, the museum is featuring a special exhibition called Driving with the Stars that celebrates the exploits of sport, culture, industry and entertainment celebrities through their individual associations with iconic Ferrari models. Members of Europe's royal families feature prominently, as do other jet-setting Ferrari owners such as Pavarotti, Jean-Paul Belmondo and Eric Clapton, all of whom became unofficial brand ambassadors. The latest celebrity to be associated with the Prancing Horse is Hugh Jackman, who is slated to play Ferrari in a biopic set to begin filming this year. The Museo Ferruccio Lamborghini near Bologna showcases the luxury car manufacturer’s most famous production models and prototypes. In a car-crazy region brimming with superlative automotive-design talent and supersized egos, epic rivalries are bound to occur. None was greater than the legendary feud between Ferrari and another local boy made good, Ferruccio Lamborghini, who made his fortune after the Second World War retrofitting discarded military equipment as tractors for agriculture. Like many a self-made man, Lamborghini bought himself a Ferrari, but soon became frustrated with what he considered an inferior clutch. So he complained directly to Enzo, who naturally took offence to his supercar being criticized by a lowly manufacturer of farm machinery. Their dispute drove Lamborghini to build, in just a few short months, what he considered a far superior car, the Lamborghini 350 GTV, which he proudly unveiled at the 1963 Turin Motor Show. At the Lamborghini museum in the village of Sant'Agata Bolognese, on the outskirts of Modena, rows of gleaming models are on display – everything from early hits such as the 350 GT to futuristic concept cars. Formula One race cars are also here, including one driven by Brazilian Ayrton Senna, the late three-time world champion, who crashed and died at the nearby Imola circuit during the 1994 San Marino Grand Prix. A guided tour of the Lamborghini factory next door takes visitors through the built-to-order assembly of the futuristic V12 Aventador, including every step from engine, chassis and carbon-fibre bodywork to the fitting of the handcrafted interiors. Watching a finished Lamborghini roll off the assembly line, I can appreciate why these magnificent machines fetch such exorbitant prices. Like their rivals in Motor Valley, these labours of love ascend far beyond the sum of their parts to become true works of modern art. Spanning the fertile Po River Valley, agriculturally blessed Emilia-Romagna is much more than a coveted destination for fine-automobile aficionados. Savvy Italians will tell you that this region, not Tuscany or Rome, produces some of the richest culinary offerings in the world. Currently recognized as home to 44 PDO (protected designation of origin) and PGI (protected geographical indication) products, including Parmigiano-Reggiano, culatello di Zibello and aceto balsamico tradizionale di Modena (Parmesan cheese, cured pork from Zibello and traditional balsamic vinegar from Modena), Emilia-Romagna is often referred to as the Food Valley because of its concentration of unique and diverse flavours. Everything from Michelin-starred restaurants to traditional street food such as piadina (flatbread) can be found here, and the region's culinary and wine heritage is celebrated by more than 25 museums dedicated to the pleasures of Italian food. To appreciate just how intertwined fine food and fast cars are in Emilia-Romagna, I visit the headquarters of another local boy made good, the late Umberto Panini, who spent the fortune he made manufacturing cigarette cards and football stickers on a Parmesan-cheese farm that also happens to contain one of the world's finest vintage-motoring collections. The late Umberto Panini’s priceless collection of vintage Maserati cars and motorbikes is on display at his family’s Parmigiano-Reggiano cheese farm near Modena. The Panini family's industrial Bio Hombre dairy farm produces an average of 12 wheels of organic Parmesan cheese a day, kept in large refrigerated storehouses. Stored in an unassuming nearby warehouse is patriarch Umberto's priceless collection of vintage Maserati cars, motorbikes and scooters. After spending the morning touring both, I depart with a kilogram of what is perhaps Italy's finest Parmesan. But sadly, not the keys to a Maserati Mistral. Modena’s Piazza Grande serves as the finish line for the annual multi-stage Cento Ore classic car rally. It's nearing a cheese-melting 40 C by the time I return to Modena's Piazza Grande to catch the conclusion of my Italian auto immersion: the finale of the Modena Cento Ore. Now in its 17th iteration, this multiday classic-car rally takes a hundred or so well-heeled participants on a scenic journey through much of Emilia-Romagna before reaching Modena. Under a scorching late-afternoon sun, vintage Alpha Romeos, Porsches, Triumphs, Maseratis, Lamborghinis and of course Ferraris zoom into the square and onto the winner's podium to receive the checkered flag to enthusiastic applause. Then, their exuberant drivers, many clad in fire-retardant racing jumpsuits, park them side by side before making a beeline for the bars and cafés ringing the square. On this day, the Piazza Grande just may be the most expensive parking lot in the world. Modena is still in a festive mood as I head to dinner at Ristorante da Danilo Modena, a traditional trattoria run by the same family for half a century. 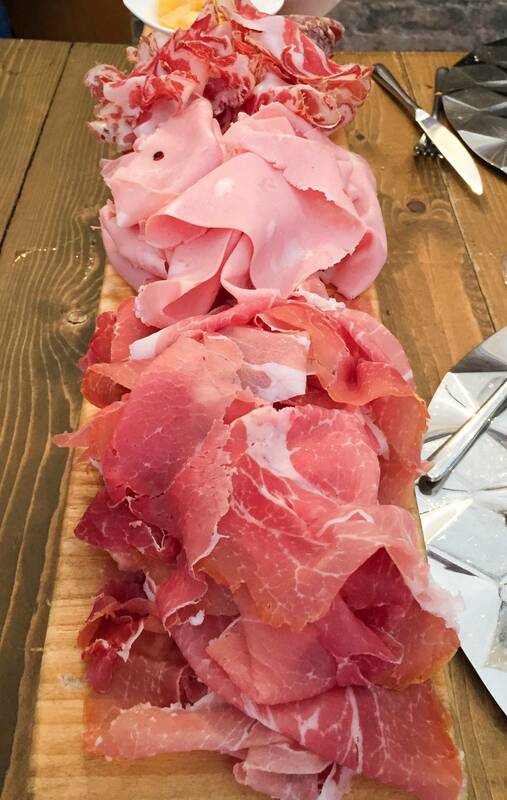 Said to serve the most authentic local cuisine in town, it doesn't disappoint, with signature dishes such as gnocco fritto con prosciutto di Modena, sformatino di verdure e crema di Parmigiano and tagliatelle al ragu, accompanied by red sparkling wine from Modesto called Labrusco di Sorbara. The only thing missing from this perfect summer evening in Italy's valley of cuisine and cars is a "hard on the brakes, easy on the eyes" cherry red Ferrari 612 Scaglietti of my own parked outside. Vineyard in Emilia Romagnaís rolling countryside. The nearest airport to Modena is in Bologna, about a 40-minute drive. It has frequent connections to most European hub airports. Modena's Central Park Hotel is an elegant, four-star hotel located in the city centre and very close to amenities and monuments. Rooms from about $210 a night. The Panini Motor Museum near Modena contains a priceless collection of vintage Italian cars, motorcycles and engines. 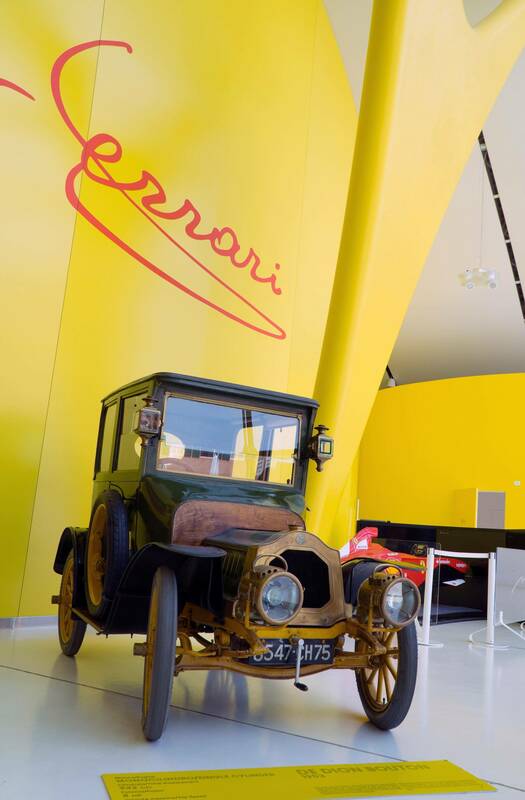 Ferrari Museum: Open daily from 9:30 a.m. to 6 p.m. For more information and tickets, visit musei.ferrari.com. Lamborghini Museum and factory tour: Open daily during the summer from 9:30 a.m. to 7 p.m. and until 6 p.m. the rest of the year, the museum and factory are located along the Via Modena on the outskirts of the city. Bio Hombre Organic Farm and classic car collection: Guided tours of the Parmigiano-Reggiano cheese dairy and Umberto Panini's classic car and motorcycle collection are available in Italian and English, Monday to Friday from 9 a.m. to 12 p.m. and 3 p.m. to 5 p.m. and Saturdays from 9 a.m. to 12 p.m. Book ahead. Autodromo di Modena: A two-lap Ferrari F430 Challenge test drive on this 2,000-metre circuit will set you back €450. Includes a congratulatory glass of prosecco and souvenir racing cap. Modena Cento Ore: This five-day classic car rally, which takes place each June, attracts drivers from around the world. For more information about the Emilia-Romagna region, including suggested Motor Valley itineraries, visit emiliaromagnaturismo.com. The writer travelled as a guest of Tourism Emilia-Romagna. It did not review or approve this article.